Please join us at Jeff Zischke’s Art/Object Gallery in Carefree on Friday, April 7th from 5:00—7:00 for a Wine & Hors d’oeuvre’s reception. 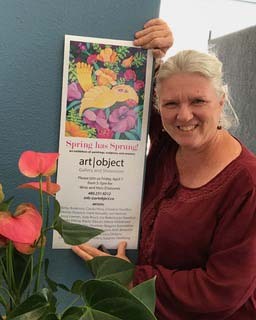 Jeff is working with volunteers from the Desert Foothills Library and the Sonoran Arts League to present an art show with local artists that would lighten everyone’s outlook. Jeff was a juror for the League Small Works Show and the Library/League Contemporary Art Show and decided to take some of these artists and showcase them in his Carefree Gallery. The show will be up for a month. Robin Ray’s painting was chosen for the poster!